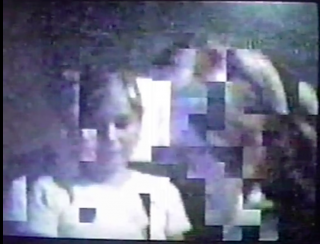 alpha 3.4 is one work in a larger series by the collective tsunamii.net that explored the the physicality and infrastructural politics of the internet. 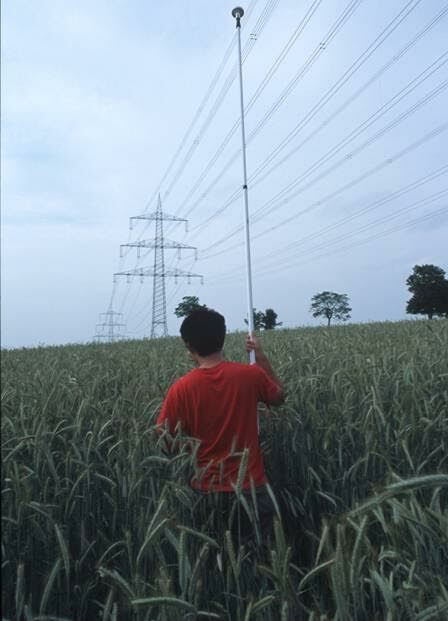 Performed as a part of Documenta 11 in Kassel, the work found artists Charles Lim Li Yong and Woon Tien Wei of tsunamii.net trekking more than 600 km from Kassel, the site of the Documenta exhibition, to Kiel, where the Documenta11 website’s server was located. 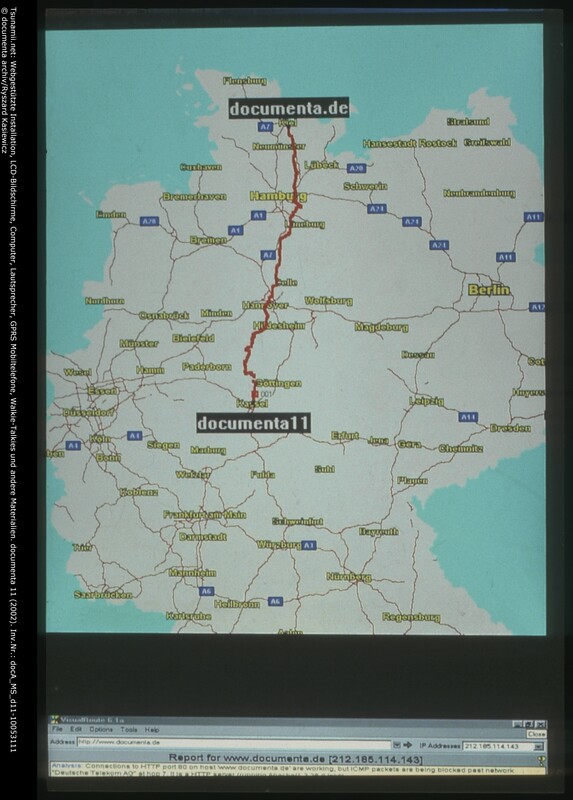 When Lim arrived at the server, he set up a webcam that broadcast a live feed of “documenta.de” as a “real object in space.” A four-screen installation in the Documenta exhibition tracked the walk as a virtual and physical journey. 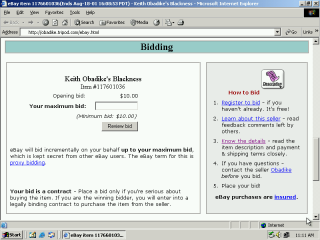 alpha 3.4 offered a timely critique of the mythologization of the internet as geographically neutral “cyberspace.” Though few materials remain from the performance, it included in Net Art Anthology as a prescient exploration of the materiality and politics of the internet and its infrastructure. 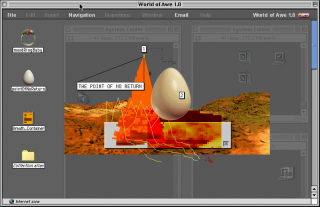 alpha 3.4 was commissioned as one of several digital projects included in documenta 11, curated by Okwui Enwezor. 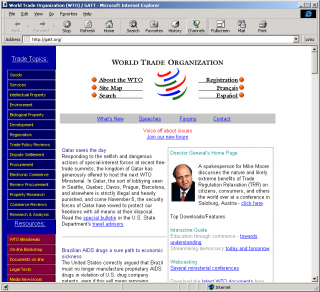 At the center of alpha 3.4 was a web browser, webwalker 2.2, that required the user to walk to the physical site of a given web server. 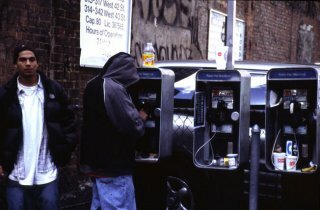 As the walker progressed on their journey, they would transmit their GPS coordinates via mobile phone to the browser, which would attempt to access IP addresses correlated to their location at any given time. 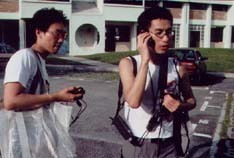 Image from alpha 3.3 (2001), a walk in physical and virtual space from Singapore to Malaysia. 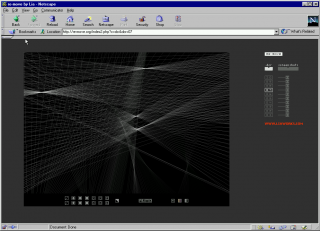 Image from alpha 3.3 (2001). 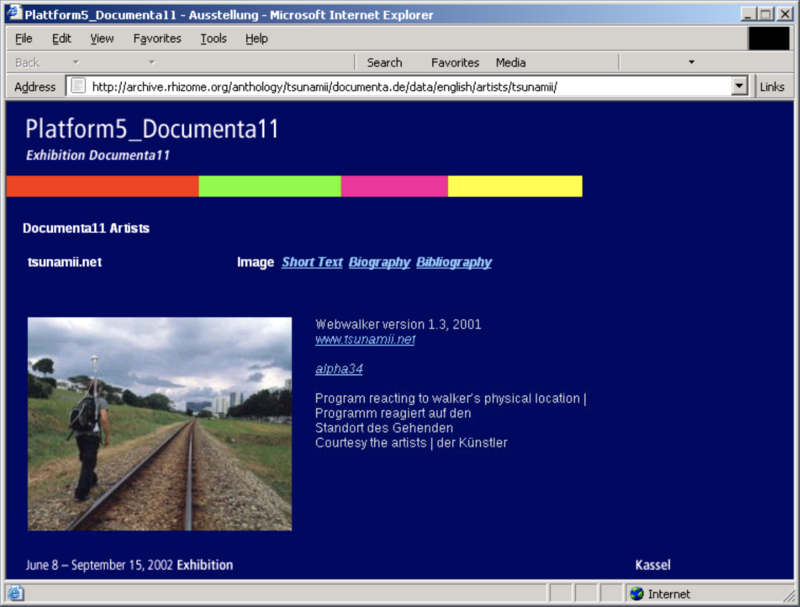 Using webwalker 2.2, the artists walked from the documenta exhibition in Kassel to a server farm in Kiel owned by Deutsche Telekom. 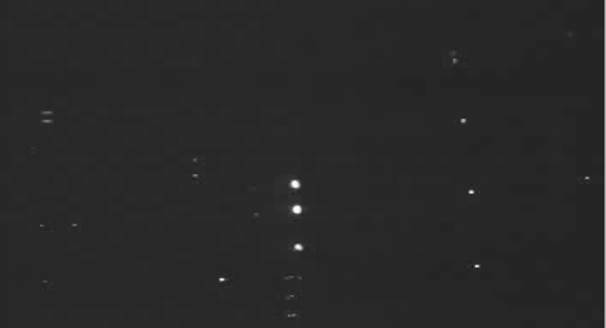 Upon reaching the doumenta11 webserver located in Deutsche Telekom’s server farm in Kiel, a webcam was installed, pointing at the physical documenta.de server. 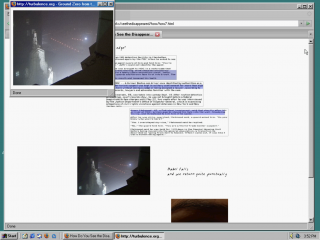 Live streamed image of the documenta.de web server. 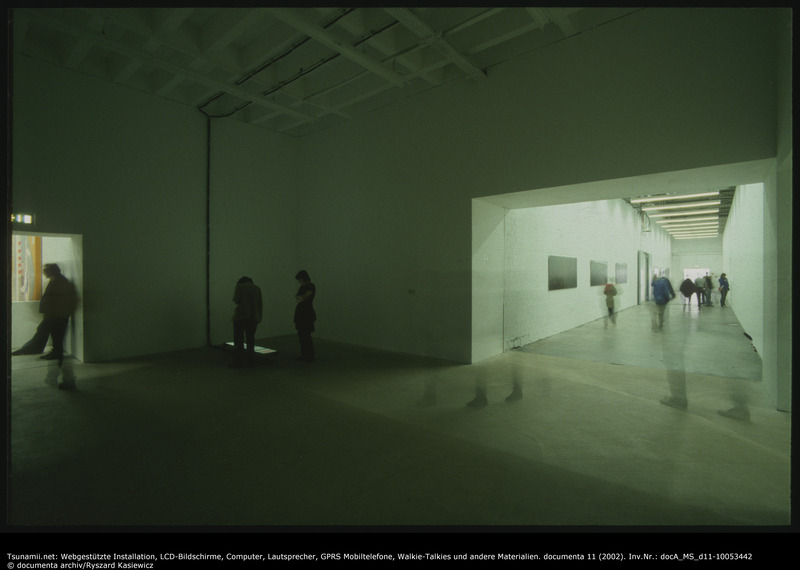 Four screens were shown on the floor of the gallery space. 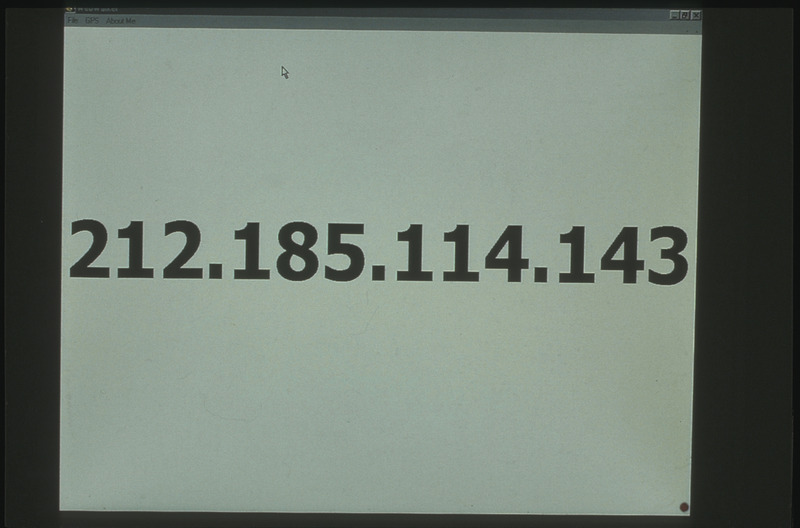 One displayed an IP address corresponding to the walkers’ location. 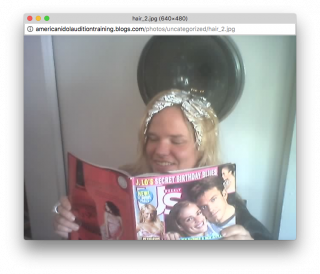 The second showed a browser that would attempt to visit that address. 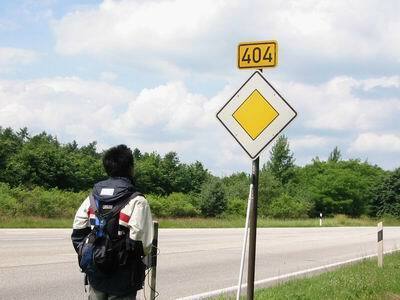 Most of the IP addresses had no public website, and would deliver a 404 error message. 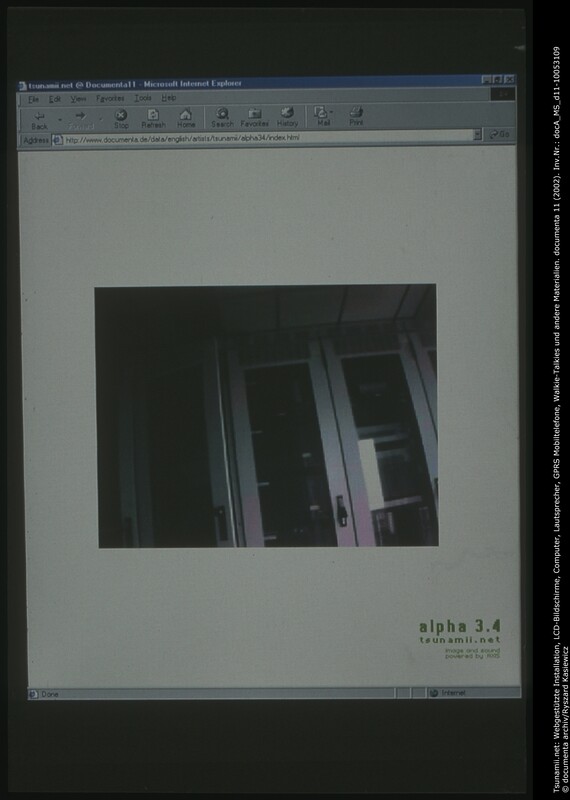 When it finally reached the IP address of the documenta.de server, the browser was redirected to the page for alpha 3.4, where the live feed of the server itself was shown. 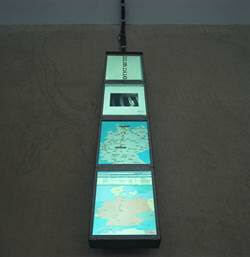 The third charted the walkers’ location on a map, and the fourth performed a traceroute to the IP address corresponding with their location. 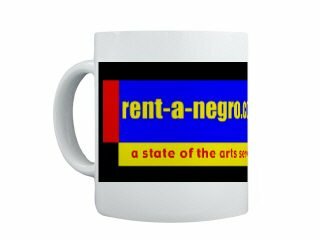 At the time of the project's conception, discourse around the internet and its rising commercial and broad accessibility still considered it as a neutral zone, divorced from material and political realities. In tsunamii.net's opinion, this view was naive and even dangerous. 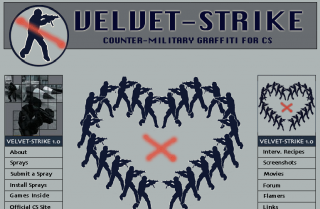 For example, tsunamii.net member Charles Lim had been involved in the CounterStrike community. In the fast-paced first-person shooter, it was clear that geographical distance directly impacted the gamer’s response time. 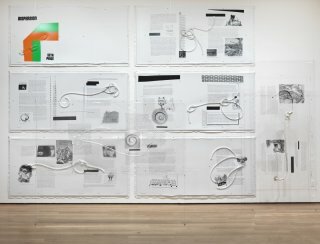 Similarly, the materials on the Documenta server–many of which had been gathered during visits to former European colonies–might be transmitted with varying degrees of success to other parts of the world with less well-developed infrastructures. Following alpha 3.4, tsunamii.net went on to explore the physicality of the virtual through further works, including 3.5, in which a web server installed in the gallery was physically crushed by accumulated web traffic, and finally alpha 3.8 (commissioned by the Walker Art Center), in which the tsunamii.net server was relocated from country to country. 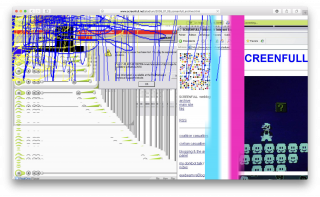 This journey through the world’s internet infrastructure came to an abrupt end when curator Steve Dietz’s role and program were discontinued by the Walker in 2003; the tsunamii.net server was hosted in Mexico at that time, and it was not updated further. 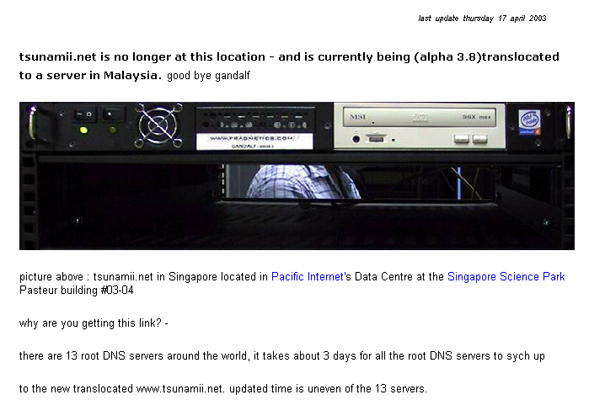 tsunamii.net was a collaboration between Singaporean artists Charles Lim Yi Yong (b. 1973) and Woon Tien Wei (b. 1975). 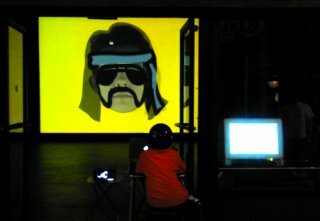 The collective was formed in 2002 to explore the relationship between physical space and cyberspace. 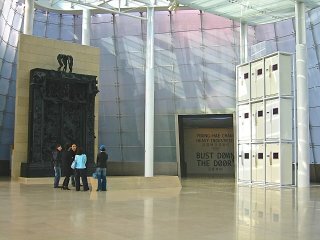 Exhibitions include Documenta 11, Kassel, Germany (2002), Media_City Seoul, Korea (2002), Nokia Singapore Art, Singapore Art Museum, Singapore (2001). 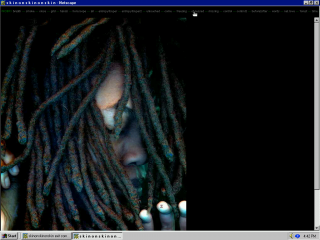 tsunamii.net was awarded commissions by Walker Art Center’s Gallery 9 and Emerging Artists, Emerging Medium 3 for alpha 3.8:translocation (2003). 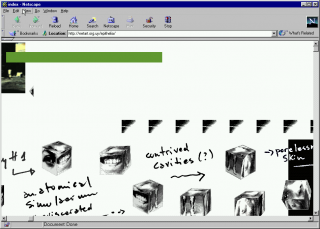 They also won the Java Artist of the Year award in 2003.